By 1967, Creed Taylor was a veteran of the music industry. He had worked numerous record labels, including Bethlehem, ABC and Verve. However in 1967, Creed Taylor left Verve to join Herb Albert and Jerry Moss’ A&M Records. This was something of a coup for A&M Records, as Creed Taylor had an impressive track record. At ABC, Creed founded one of jazz’s most influential labels, Impulse! and signed John Coltrane in 1960. With one of the legends of jazz onboard, McCoy Tyner, Sonny Rollins, Art Blakey, Charles Mingus, Albert Ayler and Archie Shepp would then sign to Verve. Impulse! would go on to release some of the most innovative and influential jazz of the sixties. By then, Creed Taylor had moved on to Verve in 1961. Now working for Verve Records, Creed Taylor introduced bossa nova to America. Creed signed artists like Antonio Carlos Jobim and Stan Getz. Their music caught the attention of Charlie Byrd and Dizzy Gillespie. Soon, Verve Records was one of the most successful jazz labels. However, after six years at Verve Records, Creed Taylor was on the move. He signed to A&M in 1967. That’s where CTi Records was born. Originally, CTi Records was an imprint of A&M. A&M was responsible for distributing CTi Records’ releases. That was the case right through until 1969, when Creed Taylor left A&M. The following year, CTi Records become an independent record company. Many people saw Creed Taylor’s decision to leave A&M as risky. Not Creed Taylor though. He saw it as a carefully calculated risk. Music was about to change. Especially jazz music. Creed Taylor foresaw the and was determined that CTi Records would be at the forefront of this change. So he began signing some of the most talented jazz musicians of that time to CTi Records. This included Chick Corea, Dave Holland, Ron Carter and Herbie Hancock. Another artist that Creed Taylor signed to Cti Records in 1970, was forty-seven year old vibes player Milt Jackson. He would spend three years at CTi Records, and released a trio of albums. This included Sunflower and Goodbye, which have been digitally remastered, and were recently released by BGO Records on one CD. On both Sunflower and Goodbye, Milt Jackson’s is joined by an all-star band, which features many other artists signed to CTi Records. By the time Milt Jackson signed to CTi Records, he was a musical veteran. He had released thirty-six albums, including collaborations with some of the biggest names in jazz. John Coltrane, Coleman Hawkins, Wes Montgomery, Oscar Peterson and Ray Charles had all collaborated with Milt Jackson. His first collaboration on an album came in 1948. Milt Jackson was then twenty-five. He was born in Detroit on 1st January 1923. Music was omnipresent in the Jackson household. It played an important part in everyday. So did the church, where Milt Jackson would later sing gospel. Before that, Milt Jackson began searching for the right musical instrument for him. This search began when seven year old Milt Jackson began to play the guitar. Then when he was eleven Milt switched to piano. However, when Milt started at Miller High School, he began playing drums and then timpani and violin. Somehow, Milt even found time to sing in the school choir. By the time he was sixteen, Milt began touring with the gospel group the Evangelist Singers. However, that wasn’t where his future lay. For sixteen year old Milt Jackson, hearing Lionel Hampton playing the vibraphone in Benny Goodman’s band, changed not just his musical direction, but his life. Realising that the vibraphone was the instrument for him, Milt Jackson spent the next few years dedicating himself to learning how to play the vibes. This paid off. Trumpeter Howard McGhee and Milt Jackson entered the studio in 1948 to record an album. They were joined by some of the top musicians of the day. Together, they recorded twelve tracks, which eventually, were released as Howard McGhee and Milt Jackson in 1955. Little did Milt Jackson realise that this was the first of a prolific career. Milt Jackson’s career would eventually spanned six decades. His recording career began in earnest in 1952. By then, Milt had formed the Milt Jackson Quartet in 1950. It would later become the Modern Jazz Quartet, which right through until 1974, when it disbanded, would released ambitious and groundbreaking music. Still, though Milt managed to juggle his solo career with his would within the Modern Jazz Quartet. Two years after the formation of the the Milt Jackson Quartet, its founder released his solo debut album, Wizard of the Vibes. It featured music recorded between 1948 and 1952. Three years later, and the Milt Jackson Quartet released their eponymous debut album on Prestige. The following year, was one of the most productive of Milt’s early career. During 1956, Milt Jackson released a quartet of solo albums. By then, Milt had acquired the nickname Bags, after arriving at a gig with bags under his eyes. They were the result of too many nights carousing into the early others. However, Milt’s new nickname provided inspiration for many an album title, including Roll ‘Em Bags. It featured music that had been recorded between 1949 and 1956; while Meet Milt Jackson had been recorded between 1954 and 1956. Milt’s other releases were Opus de Jazz and The Jazz Skyline. They showcased Milt Jackson as developed and blossomed as an artist. That would be the case throughout the remainder of the fifties. When Milt Jackson released Plenty, Plenty Soul in 1957, it proved to be his final release for Savoy. He would move to Atlantic Records, and later in 1957, released Plenty, Plenty Soul and Bags and Flutes. Milt continued to be a prolific solo artist, but still somehow, found time to record with the Modern Jazz Quartet and collaborate with other artists. This included recording Soul Brothers with Ray Charles in 1958. Then in 1959, Milt Jackson recorded Bean Bags with Coleman Hawkins. That year, Milt released his last solo album of the fifties, Bags’ Opus. It’s regarded as one of the finest album Milt recorded for Atlantic Records during the late fifties. The Atlantic Records’ years continued into the sixties. As the sixties dawned, Milt Jackson released Bags and Trane, his collaboration with John Coltrane in 1960. It was regarded as was one of Milt’s best collaborations, and featured a series of stellar performance from both men. The other album Milt released during 1960, was The Ballad Artistry Of Milt Jackson, where he works his way through a series of standards. Alas it wasn’t one of Milt’s finest hours. Reviews of the the album were mixed. Milt’s next album was another high profile collaboration. This was Soul Meeting, a collaboration between Milt Jackson and Ray Charles. It was released in 1961, the year Milt’s time at Atlantic Records drew to a close. For the rest of 1961, he released albums on a variety of labels. Among them, were Verve, who released Very Tall, Milt Jackson’s collaboration with jazz pianist Oscar Peterson. It was released in 1961, the same year that Milt released Statements on Impulse! However, it was Milt’s 1961 collaboration with Wes Montgomery, Bags Meets Wes! that resulted in him finding a new home, Riverside. It was home for Milt Jackson for the next few years. Milt released Big Bigs and Invitation during 1962. For Someone I Love followed in 1963, with Milt Jackson Quintet Live at the Village Gate being released in 1964. By then, Milt had moved on again. The next few years saw Milt Jackson flit between labels big and small. He released Jazz ‘N’ Samba on Impulse in 1964, and somewhat belatedly, Atlantic Records released Vibrations, which had been recorded in 1960 and 1961. That was when Atlantic Records was home for Milt. Not anymore. Home was now the Limelight label, which released In A New Setting in 1964. This would home for Milt for the next couple of years. Before that though, Milt would on the collaboration trail. During 1964, released three collaborations. This included Milt Jackson with Orchestra Enrico Intra’s album Sings. Milt Jackson and Sonny Still collaborated on the album In The Beginning. However, the third collaboration was with Ray Brown, and would become Milt’s most productive and longest lasting musical of the sixties. It was in 1964 that Milt Jackson and Ray Brown released the first of two collaborations on Verve, Much in Common. This was followed by Ray Brown-Milt Jackson. The other album Milt released during 1965 was Milt Jackson At The Museum of Modern Art. Just like In A New Setting, it was released on Limelight, which had become Milt’s new home. Limelight released Born Free in 1966, which was his swan-song for the label. Milt Jackson returned in 1968 with a new ensemble, Milt Jackson and the Hip String Quartet. It included Hubert Laws who Ron Carter, who Milt would join forces with at Creed Taylor’s CTi Records. That was two years down the line. Before that, Milt Jackson and Ray Brown released a trio of collaborations during 1969. That’s the Way It Is and Just the Way It Had to Be were live albums. The other album Memphis Jackson, was a studio album which featured an all-star cast, that included the Ray Brown Big Band. Despite the illustrious array of talent on display, critics weren’t impressed. It was an inauspicious end to the sixties. During the sixties, Milt Jackson had been a prolific artist. Not only had released numerous solo albums, but he had continually collaborated. Then there was the albums Milt had recorded with the Modern Jazz Quartet. They recorded throughout the sixties, and were equally prolific. Despite this, the Modern Jazz Quartet were no longer regarded by the latest generation of jazz aficionados as pioneers. Instead, fusion was King where jazz was concerned. Fusion was a marriage of jazz, funk and rock and psychedelia, that had been born in the late sixties. Among its founding fathers were Gary Burton, Larry Coryell and Miles Davis. They brought onboard Chick Corea, Dave Holland, Ron Carter and Herbie Hancock. With some of jazz’s big hitters joining the fusion revolution, Creed Taylor began signing some of this musical movement’s leading lights to CTi Records. However, Creed Taylor wasn’t just signing artists who played fusion. He had signed jazz guitarist George Benson and several Bossa Nova artists. His latest signing in 1970, was forty-seven year old Milt Jackson. Signing to CTi Records was a no-brainer for Milt Jackson. He had been drifting for the last few years, and latterly, hadn’t reached the heights of his early career. Maybe Creed Taylor could rejuvenate his Milt’s career? CTi Records was regarded as a label that was going places. It was also a label that was home to some of the best and most innovative jazz musicians of a generation. These musicians would happily switch between bandleader and sidemen. In the case of Milt Jackson, he made his CTi Records’ debut on Stanley Turrentine’s Cherry. He was one of the guest artists on the album when it was recorded in May 1972. 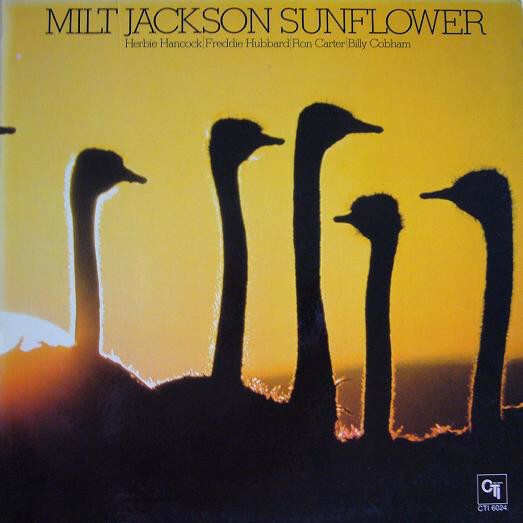 Then seven months later, on the 12th and 13th December 1972, Milt Jackson released his CTi Records’ debut Sunflower. Before the recording of Sunflower began at Rudy Van Gelder Studio in Englewood Cliffs, New Jersey on the 12th and 13th December 1972, Milt Jackson set about choosing the material for the album. Four songs were chosen, Milt’s composition For Someone I Love (What’s Your Story); Alan and Marilyn Bergman’s What Are You Doing the Rest of Your Life? ; Thom Bell and Linda Creed’s People Make the World Go Round and Freddie Hubbard’s Sunflower. These four tracks would be recorded by an all-star band. At its heart, was a rhythm section that featured drummer Billy Cobham, bassist Ron Carter and Jay Berliner. They were joined by pianist Herbie Hancock, percussionist Ralph MacDonald, trumpeter Freddie Hubbard and Milt Jackson on vibes. Augmenting the core band was harpist Margaret Ross, plus string and woodwind sections. Arranging Sunflower and conducting the band was Don Sebesky. Creed Taylor took charge of production on Sunflower, which he hoped would transform Milt Jackson’s career and fortunes. That proved to be the case. Prior to the release of Sunflower, critics hailed the album Milt Jackson’s finest album of many a year. Backed by a crack band of jazz’s top players, Bags rolled back the years, and was like a man reborn musically. Someone I Love (What’s Your Story) opens that album, and just a lone acoustic guitar plays. It sets the scene, before for a Freddie Hubbard’s melancholy trumpet and a wistful lush strings. When it comes to the solos, Milt plays with fluidity and flamboyance, that comes with thirty years experience. Similarly, Freddie Hubbard’s trumpet and Herbie Hancock’s piano play leading roles, in a track that’s beautiful, ruminative and showcases the considerable talents of Milt and his band. There’s a similar beauty to the balladry of What Are You Doing the Rest of Your Life?, which has a widescreen, cinematic sound. After this, it’s all change. People Make the World Go Round which had given The Stylistics a hit single, is then reinvented by Milt Jackson. It becomes a mid tempo track, where jazz, funk and soul are combined. Trumpeter Freddie Hubbard and Herbie Hancock on piano and Fender Rhodes are at the heart of everything good. Milt is content to play a supporting role, as his band reach new heights. Sunflower closes the album, and is an eleven minute epic. Lush strings ensure the arrangement soars, as Freddie Hubbard’s flugelhorn takes centre-stage. Later, so does the piano, and Milt’s shimmering vibes as jazz and 4/4, gives way to samba. However, it’s Freddie Hubbard that plays a starring role in what was the finest album Milt Jackson had released for many a year. Record buyers agreed. When Sunflower was released in 1973, it reached number five in the US Jazz charts. This turned out to be the most successful album of Milt Jackson’s career. Not for the first time had Creed Taylor transformed an artist’s career. Now it was a case of doing it all again. After the success of Sunflower, Creed Taylor sent Milt Jackson into the studio to record another album in December 1973. Milt Jackson and his band would record four new songs. This included the he Milt Jackson penned S.K.J. and the jazz standard Old Devil Moon. Detour Ahead had been penned by Lou Crter, Herb Ellis and Johnny Frigo, while Goodbye was a Gordon Jenkins composition that for many a year, had been the closing song to the Benny Goodman Orchestra’s show. These tracks were recorded at Rudy Van Gelder Studio in Englewood Cliffs, New Jersey during December, 1973. Joining Milt Jackson this time round was a much smaller band, than last time. The sextet featured a rhythm section of drummer Steve Gadd and bassist Ron Carter, plus pianist Cedar Walton, flautist Hubert Laws and Milt Jackson on vibes. Creed Taylor again produced Goodbye. These four tracks would form the basis of Goodbye. There were tracks from the Sunflower sessions that hadn’t been used. The best of these tracks was the Horris Silver composition Opus de Funk. It had been recorded on December 12th 1972, at Rudy Van Gelder Studio in Englewood Cliffs. That day, the lineup featured drummer Billy Cobham, pianist Herbie Hancock, trumpeter Freddie Hubbard and Milt Jackson on vibes. Now Sunflower was complete, and would be released later in 1974. When critics received a copy of Goodbye, it was credited to Milt Jackson with Hubert Laws. That was no surprise to those who heard the album. The Houston born flautist had played such an important role in the sound and success of album. None more so that than the languid, dreamy take on Old Devil Moon. It just meanders along beautifully, with Hubert Laws’ flute and Milt Jackson’s vibes playing leading roles.The rhythm section play slowly and carefully, never overplaying and always leaving space for the soloists. It’s a similar case on S.K.J., with its bop stylings. As it meanders along, Cedar Walton’s piano and the vibes playing starring roles, as an element of funk is introduced later as S.K.J. starts to groove and swing. Mostly, though, jazz is to the fore on S.K.J. Soon, though, the tempo rises. Opus de Funk finds Milt Jackson and his band stretching their legs. The tempo rise on this oft covered hard bop number. With Steve Gadd’s drums propelling the arrangement along, a glorious and smoking slice of jazz unfolds. However, on Detour Ahead the tempo drops. Milt and his band take the opportunity to explore the track’s subtleties and nuances. That’s the case throughout from the opening bars to the closing notes, when the band never miss a beat. 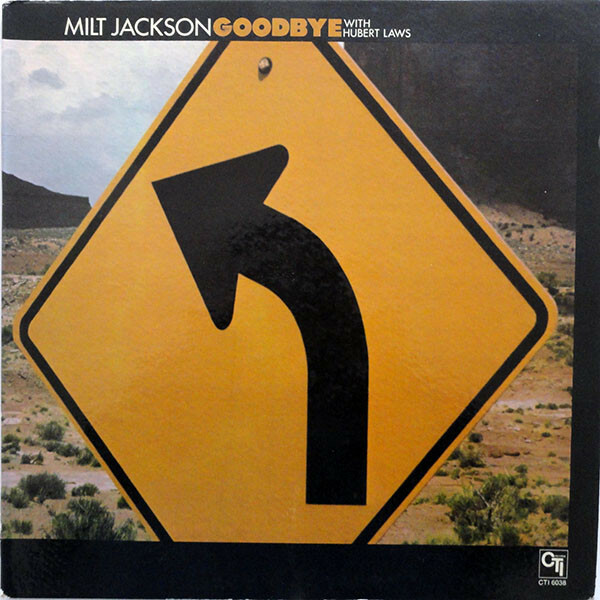 All too soon, Milt Jackson bids the audience Goodbye on the mid-tempo title-track.Just like the previous track, everyone more than plays their part in the sound and success of Goodbye. However, when the solos come round, Hubert Laws steals the show, with pianist Cedar Walton deserving an honourable mention. Milt seems content and secure enough, to allow other members of the band shine. He knows it’s for the greater good, and that it’s his name that’s on Goodbye. It was released later in 1974. When Goodbye was released, most of the reviews were positive. The reinvention of Milt Jackson continued, on album where elements of post bop, hard bop and funk. This results in music that swings, and is melodic, harmonic and full of subtleties, surprises and nuances. Goodbye is also an accomplished and polished album, from a band that features seasoned jazzers. Despite this, Goodbye failed to replicate the commercial success of Sunflower. Goodbye still found an audience, but not like Milt, Creed Tylor and everyone at CTi Records had hoped. It was disappointing commercially, considering Sunflower had been Milt Jackson’s biggest selling album. That remained the case throughout the rest of Milt Jackson’s career. He continued to record for record labels big and small right up until his death in 1999. However, never again, did one of Milt Jackson’s albums sell as many albums as Sunflower. It’s was, without doubt, one of the best albums Milt Jackson had released in many a year. His career was rejuvenated at CTi Records. 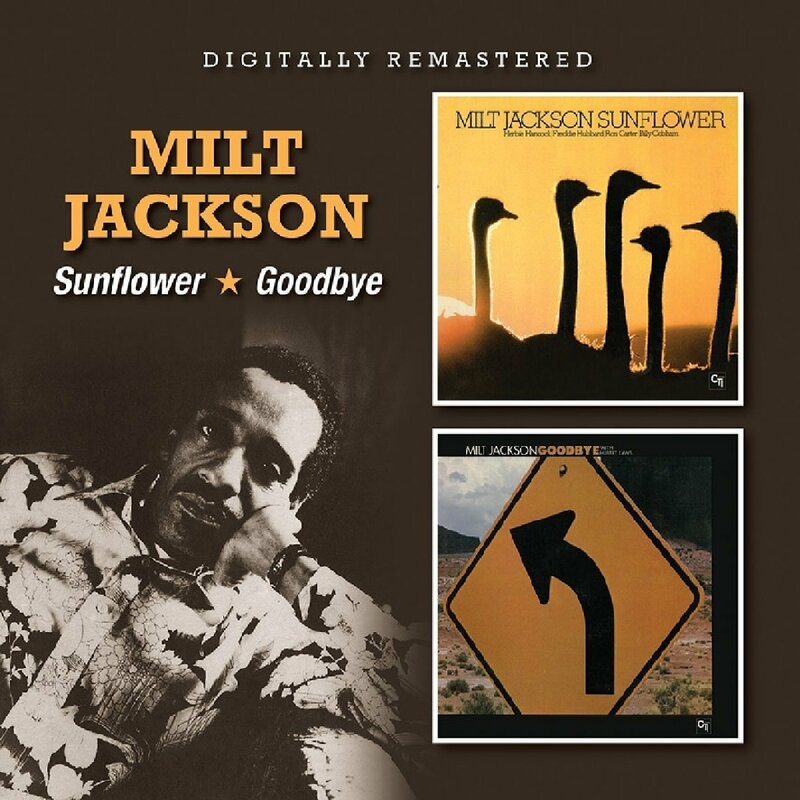 A reminder of this is Sunflower and Goodbye, which Milt Jackson released in 1973 and 1974. Both albums find Milt Jackson being accompanied by an all-star band, as he works his way through original songs and cover versions. Buoyed by such a talented band, Milt Jackson delivers a series virtuoso performances on his trusty vibes. Then on other tracks, he’s content to let other remembers of the band shine on Sunflower and Goodbye. Both Sunflower and Goodbye have been digitally remastered, and were recently released by BGO Records on one CD. They’re a welcome reminder of Milt Jackson, who is one of the greatest vibes players in jazz history. ← SANDY DENNY-WHO KNOWS WHERE TIME GOES?